This year consider giving someone an Eco-Friendly or Sustainable gift. Something that will either last a lifetime or is chemical free. The earth will appreciate it and so will the recipient. We’ve put together a list of unique gifts that will please anyone on your Christmas list this year. Art is something you can hold on to and enjoy forever, and even pass down for generations! There are so many talented artists in our beautiful city. No matter your taste in art, Arts Ally has you covered. You can filter through by size, style, price and colour or look through a curated collection (my favourite being “For the love of our city”). 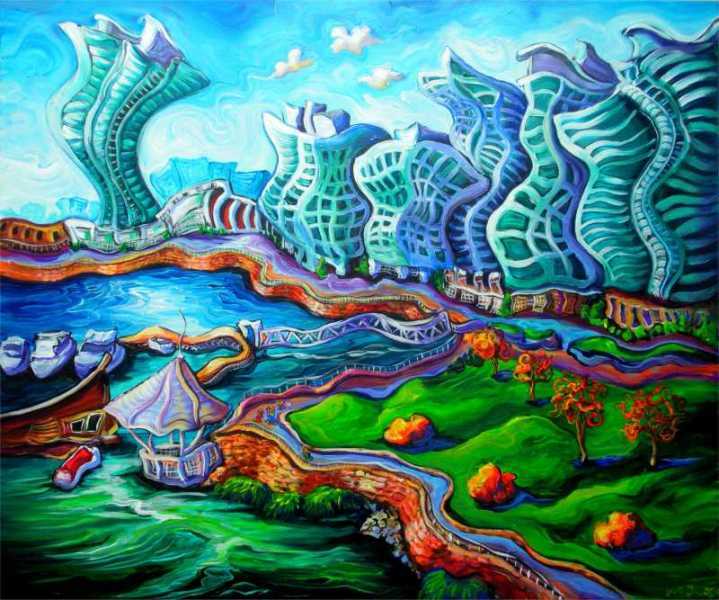 Pictured above is a piece by Laura Zerebeski ,an expressionist painter, called “Yaletown” priced at $1,700. These eco friendly coconut wax candles are a must have for any home. 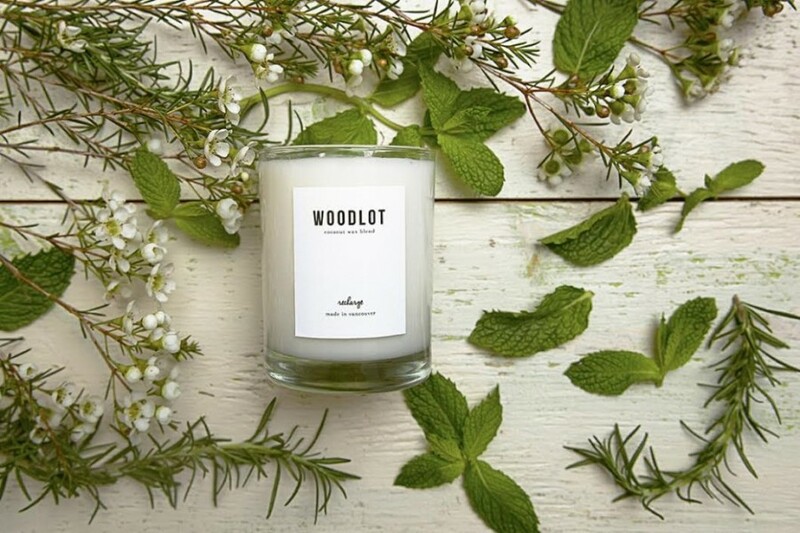 Unlike palm or soy wax, coconut wax does not have to be replanted, making Woodlot candles a renewable source. Bonus: the melted wax can be applied to hands and cuticles. These candles are available in 4 aromatherapy scents: Original, Cascadia, Rekindle and Recharge. Having difficulty on choosing one? We recommend “Recharge” which is a blend of rosemary and mint, it’s a super uplifting and recharging combination (which is much needed throughout the holiday season). These candles can be purchased locally from these stockists. For a lot of people, the holidays are all about spreading peace as well as finding peace. Mala Collective’s “I Am Peace” mala from the “I Am Enough” collection will do just that. Wearing this Amethyst stone is believed to provide one with stability, strength, inspiration, and a true sense of peace, along with increased spiritual power. Give the gift of peace. 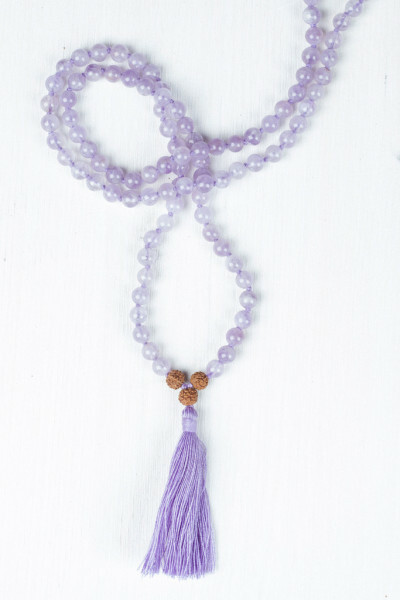 This mala can be purchased online. The little ones on your list will thank you with cuddles for keeping them soft and cozy in these outfits! Parade Organic clothes are made of 100% certified organic cotton. They take pride in safe and eco-concious manufacturing. These sets can be purchased locally at Parade Gastown and Parade Granville Island. 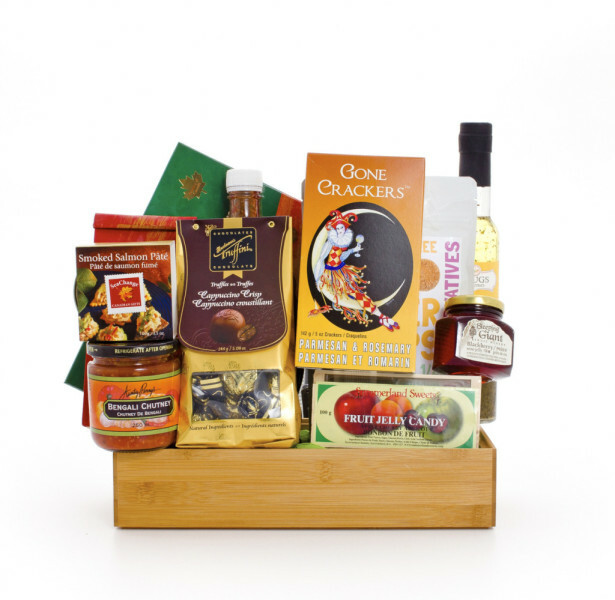 This gift basket, by Green & Green, is ideal for the localvore. Full of fine B.C. edibles including Summerland Sweets Fruit Syrup, Aunty Penny’s Chutney, Truffini Truffle Pouch, Trugs Gourmet Vinaigrette, Saltspring Tea, Hidden Garden Ginger Snaps, Smoked Salmon Pate, Summerland Sweets Wine Jelly, Gone Crackers, Smmerland Sweets Candy, and Smoked Salmon. This basket can be purchased online. Help the beauty addict on your list make a healthy choice with One Love Organics “Merry & Bright” facial set. Brighten, nourish and tone after all the holiday stress! This set, along with many other sustainable beauty products, can be purchased locally at Eco Diva Beauty This gift keeps on giving when you make a purchase from Eco Diva Beauty, a portion of each sale goes towards a charity of your choice that Eco Diva supports. Pyrrah, originated in our very own Vancouver, is now recognized worldwide. I don’t need to tell you much about this brand because I’m sure you already know, but if you haven’t yet check out their Pyrrah x Game Of Thrones collection, you are seriously missing out. 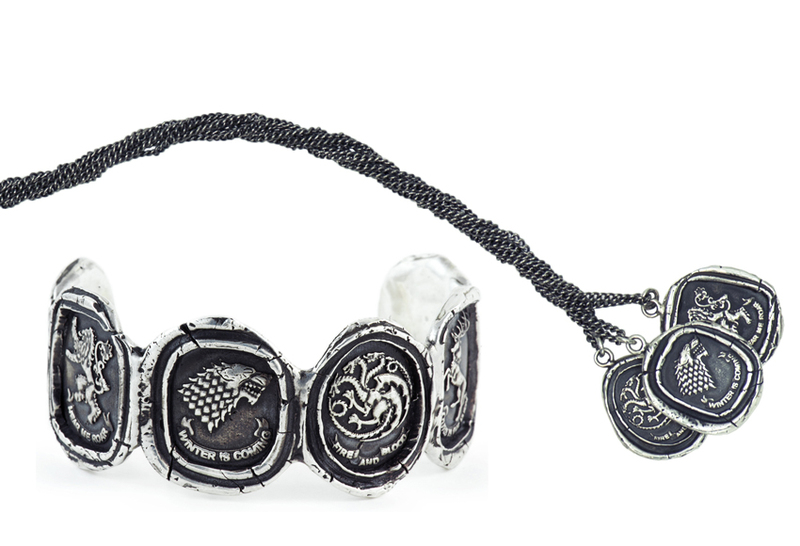 This is the perfect gift for the Game Of Thrones fanatic on your list. All of their jewellery is handcrafted in their studio in Vancouver and is cast in reclaimed and recycled 14k gold and sterling silver to reduce environmental impacts. To learn more about thier green practices read here. This line can be purchased locally at Blue Ruby. 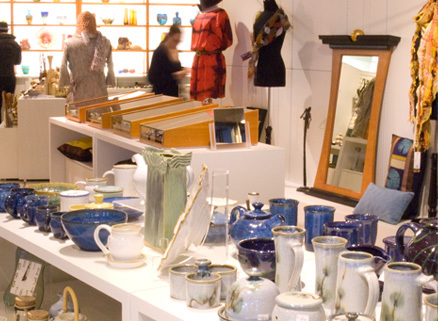 Located on Granville Island in the Net Loft, Circle Craft Co-operative features the work of over 180 craftspeople from across British Columbia. For every season of giving, Circle Craft features a wide selection of contemporary and traditional craft in clay, glass, fibre, wood, metal and mixed media. This store has something for everyone; and so many pieces that will be enjoyed for a lifetime. For that fashionable yet environmentally conscious woman on your list, a Nicole Bridger Design is a no brainer. Each of her collections are tailored from the highest quality ethical materials. “Nicole Bridger Design was founded on the belief that fashion doesn’t have to sacrifice a commitment to the environment.” You can purchase the above pictured “Hopeful” dress online or at the Nicole Bridger Flagship Location priced at $428. Throw a few of these into your stocking stuffers this year, you will not be disappointed. 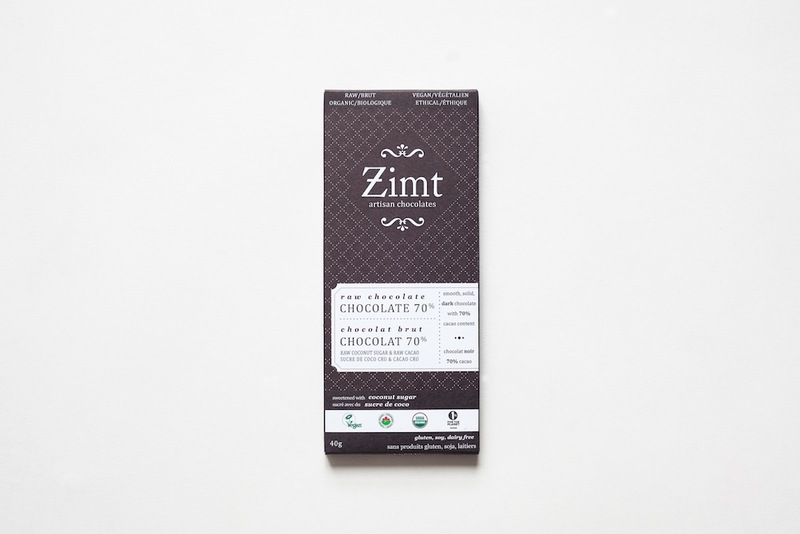 Zimt chocolates are raw, vegan, fair trade and delicious!! Even their packaging is sustainable. The plastic wrappers for the chocolate bars are actually plant-based, just throw them in your compost. As if that’s not enough for them to make it on this list, they are also members of One Percent for the Planet! These chocolate bars can be purchased online or find a location near you using the store locator.